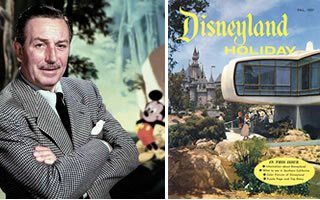 Above left: Walt Disney in his prime. 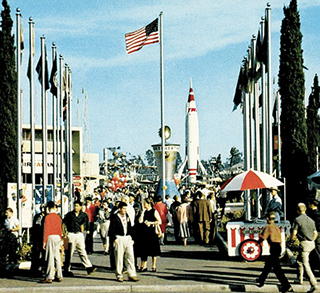 Above right: Fall 1957 Disneyland Holiday magazine. 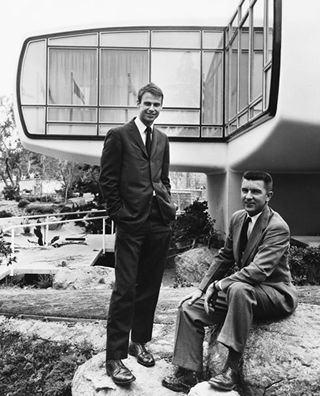 House of the Future architects (L-R) Marvin Goody and Richard Hamilton. Goody was the prime designer of the house, Kirwan says. Hamilton served as organizer and engineer. A second grad student completed the design team, Kirwan says, which worked closely with Mike Gigliotti, Monsanto’s master of molded plastics. Kirwan, who later became a partner in a leading architecture and engineering firm, designing about 150 schools, industrial plants, and other buildings, was more interested in buildings that worked than in powerful forms, and as Goody’s design evolved Kirwan voiced doubts. The plan called for equal-sized U-shaped plastic rooms—a living room, a family room combining dining and kitchen, a parents’ bedroom, and a kids’ bedroom. The rooms, raised five to eight feet above the ground, would be arrayed like a Greek Cross from a central concrete core that contained bathrooms and utilities. Rooms were made from curved, prefabricated plastic sections. One person he mentioned it to, who worked in marketing for Monsanto, brushed off Kirwan’s concern. He said Monsanto loved Goody’s design because of the ‘My God’ factor. Kirwan remembers a dinner in a hotel ballroom in New York City—two dozen people, architects from MIT, Monsanto execs, the model of the House of the Future on rapturous display, and Disney himself regaling the crowd about his early days with Mickey. “It was spectacular for a green kid like me,” Kirwan recalls.